Editorial: Share me and Like me! Cemented implant restorations are widely used by many dentists. The traditional abutment design resembles a natural tooth prepared for a crown with a similar taper and a chamfer finish line. A frequent complication associated with implant restorations in the esthetic zones is the recession of buccal gingiva over time. Abutment morphology, among several other prosthetic factors, may play an important role in the stability of the gingival margin in esthetically sensitive areas, but this has never been thoroughly analyzed. Recently, a prosthetic technique called biologically oriented preparation technique (BOPT) has been proposed, which utilizes a feather-edge preparation on natural abutments, and it has been claimed that applying the concepts of this technique to implant abutments could improve long-term gingival margin stability. At present, there is no available evidence to confirm this claim. Moreover, some concerns may arise if this particular design is implemented in every clinical situation. With these considerations in mind, this article proposes the "hybrid abutment" design (HAD), a new design that includes a combination of the two types of features - a feather edge on the buccal side, and a chamfer finish line on the lingual side. The article also presents a rationale for the use of different abutment designs for different situations. This first article in the series (Part I) aims to present an updated rationale and treatment approach for indirect adhesive posterior restorations based on the best scientific and long-term clinical evidence available. The proposed treatment concept relies on the basic ideas of (1) the placement of an adhesive base/liner (Dual Bonding [DB] and Cavity Design Optimization [CDO]) and, when needed, (2) a simultaneous relocation of deep cervical margins (Cervical Margin Relocation [CMR]), prior to (3) impression taking to ensure a more conservative preparation and easier-tofollow clinical steps, and the use of (4) a highly filled, light-curing restorative material for the cementation (Controlled Adhesive Cementation [CAC]), together with restoration insertion facilitation, the application of sonic/ultrasonic energy, and/or material heating. The suggested clinical protocol will help the practitioner to eliminate the most frequently experienced difficulties relating to the preparation, isolation, impression taking and cementation of tooth-colored inlays and onlays. This protocol can be applied to both ceramics and composites as no material has been proven to be the most feasible or reliable in all clinical indications regarding its physicochemical and handling characteristics. For the time being, however, we have to regard such indirect restorations as a biosubstitution due to the monolithic nature of the restoration, with still very imperfect replication of the specific natural dentinenamel assemblage. Optimal results can be obtained on direct restorations by the application of layering procedures that combine the accurate morphological insertion of restorative materials with the knowledge of the optical and mechanical properties of both composite resin and natural hard dental tissue. Even if the finishing procedures on restorations, such as margination (the trimming of margins), are minimized by anatomical layering techniques, finishing can still be highly complicated due to a number of pre-finishing sequences using specific instruments proposed in the literature, which include finishing burs and abrasive discs. Finishing procedures performed with a scalpel on polymerized direct composite restorations can improve the quality of the final sculptured surface by developing natural contours and characteristics and by removing the excess restorative material at the tooth-structure margin. Enhanced movement control and fine fingertip perception of the surface texture while moving the scalpel blade allow the operator to detect and cut the excess composite material during the margination procedure and to refine the final anatomy. Avoiding the use of finishing burs during finishing procedures on direct composite restorations may save adjacent enamel surfaces from abrasive damage. The composite surface and margins may also benefit from using the scalpel finishing technique, considering the potential risk of excess removal and surface crazing that the improper use of finishing burs could cause to composite material. The purpose of this article is to propose and describe the scalpel finishing technique step by step, as well as to briefly discuss the advantages of its application within the limits of a clinical case report. Purpose: To evaluate the clinical performance of lithium disilicate (LiDiSi) crowns with a feather-edge finish line margin over a 9-year period. Materials and methods: In total, 110 lithium disilicate crowns, 40 anterior (36.3%) and 70 posterior (63.7%), were cemented with resin cement after fluoridric acid and silane surface treatment and observed by a different clinician. The data were analyzed using the Kaplan-Meier method. The clinical evaluation used the California Dental Association (CDA) modified criteria after recalling all patients between January and April 2013. Results: Two crowns had failed and were replaced due to core fractures. One chipping occurred on a first molar and the ceramic surface was polished. The overall survival probability was 96.1% up to 9 years, with a failure rate of 1.8%. Conclusion: In this retrospective analysis, lithium disilicate with a vertical finish line used in single-crown restorations had a low clinical failure rate up to 9 years. The surgical correction of soft tissue defects on the facial aspects of dental implants is documented as an unpredictable procedure. Since the customization of the prosthetic emergence profile contributes significantly to the final esthetic outcome of the soft tissue, a combined surgical-prosthetic approach has been described in the literature. In the case presented in this article, a multidisciplinary approach was used to treat a patient's anterior sextant. It included the treatment of a previously placed implant, perfectly osseointegrated, with a 2 mm recession of the facial soft tissue. Two connective tissue grafting procedures were performed, in conjunction with the modification of the prosthetic profile of the provisional restoration and the definitive abutment. The final esthetic outcome satisfied the patient and resolved the main complaint, and is documented to have been stable for 5 years. 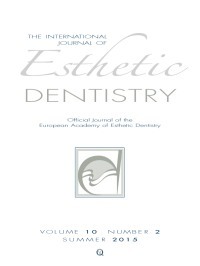 Aim and objectives: To determine whether or not people from different ethnic backgrounds have different attitudes towards dental esthetics and chose different dental appearances in terms of tooth shade, and to determine whether the dental professional's choice and the individual's own choice have any relationship with what the individual ideally perceives as esthetically pleasing. Methodology: For this cross-sectional analytical study, 120 volunteer students from the University of Sheffield (excepting dental students) from various ethnic backgrounds, of different ages, of both genders, and with varying degree/educational levels were recruited from the campus. The volunteers were asked to complete a questionnaire containing 9 adapted attitudinal statements regarding positive or negative dental esthetic perceptions in terms of tooth shade, with responses on a 5-point Likert scale from "Entirely agree" to "Entirely disagree". Scores for all attitudinal statements were summed up to give an attitudinal score. The participants' ideal, perceived, and actual (self-assessed and investigatorassessed) tooth shade was also determined using a shade guide and a facial mirror. Results: No association between ethnicity and attitudinal score was found. However, statistically significant associations were found between the participants' degree/educational level (P = 0.004, 95% Confidence Interval (CI) = -4.18 to -0.82) and their ideal tooth shade value (P = 0.038, 95% CI = -3.53 to -0.11). There were strong correlations between self-assessed and professionally assessed tooth shade value in all ethnic groups, with Spearman's rank correlation coefficient (rho) being ρ > 0.6. Regarding ideally desired and perceived tooth shade value, weak correlations were found in all ethnic groups (Spearman's rho being ρ < 0.4). Conclusion: Although no significant association was found in this sample between ethnicity and attitude towards dental esthetics with regard to tooth shade, both ethnicity and dental esthetics are very diverse terms with multiple dimensions, each of which needs further investigation with regard to their mutual association. Janakievski, J. / Kokich, V. O. / Kinzer, G.
Gracis, S. / Orloff, J. / Janakievski, J.